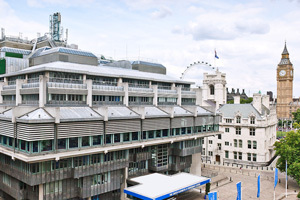 Compass Group UK & Ireland has secured a five-year deal to supply the catering at The Queen Elizabeth II Conference Centre (QEIICC), a deal worth in excess of £20m. Following a competitive, European-wide tendering process, the catering business was awarded the contract, which will see Leith’s - a Compass sport, leisure and hospitality brand - work in partnership with the Centre to create a new delegate experience. Compass revealed it has developed new concepts as part of the deal designed to appeal to the conference centre’s diverse customer base. The company will be working with the 2009 winner of BBC Two’s MasterChef Steve Groves, now head chef at Roux at Parliament Square, which is operated by Compass’ executive dining business Restaurant Associates. English chef and broadcaster Allegra McEvedy has also partnered with Compass and will act as a mentor to the culinary team at the conference centre, ensuring healthy eating and the use of sustainable ingredients are a focus of the delegate menus. Compass’ smart food menu will focus on brain foods to help improve concentration and productivity throughout the day. Dishes will include ceviche of English coasted sea reared trout with avocado mousse; lemon verbena poached sprouting broccoli and cauliflower smoothie with toasted almonds; and soy and haricot bean salad with zucchini flowers. Mark Taylor, chief executive, QEIICC, said: "This contract heralds a new era for catering at the QEIICC. We were looking for a caterer that we could work in close partnership with; a company that would work with us and our clients in a proactive collaborative and bespoke fashion. "Leith’s/Compass have been selected again to work with the Centre based upon a combination of their partnership approach, depth of delivery and flexibility, combined with exceptional service and innovation." Colin Bailey, managing director for Compass sport, leisure and hospitality, added: "Our partnership with the Queen Elizabeth II Conference Centre spans over two decades and I’m thrilled that we have been given the opportunity to build on this longstanding relationship and excited about the plans we have in place. "The conference and events market is extremely competitive; vital to the success of a venue is its ability to offer something different and I believe our new food concepts and chef partnerships coupled with the fantastic conference facilities at the QEIICC have enabled us to do this."